Oooh I haven't watch the Money not enough 2 yet. I heard it's funny and touching at the same time! Hope to catch the movie soon. If you think Eagle Eye was bad, wait till you watch Max Payne. Ho hum. I had never heard of these (all we watch are kid shows around here) but want to check out the money one. gallivanter, really? Well, I'm glad I didn't watch Max Payne! health nut wannabee mom, yeah check it out, although you may not catch the jokes since it's in Chinese language and the English translation may not adequately catch the real meaning of what is being said. It is a touching movie. I was crying tons because Lai Meng's dementia character and her children's responses to her illness is a mirror of my real life. My Mom has dementia, the sad scenes portrayed in this movie are very real. Haven't watch Money not Enough. Should be good! I love Jack Neo's movies. kitkat, I think no more showing in cinemas. Go get the DVD! eastcoastlife, how come you didn't blog about it? Some more got invited by Jack Neo! Sorry to hear about your mom. Yes, the sad scenes were very real to life. That's one reason why it was so touching. I think everyone cried in the cinema. i watched halloween yesterday. gosh, it was such a let down !! i agree that the film started out fun, especially the killing that was done among the trees, away from the crowd, walked away expressionless, etc. but the "after growing up" part is boring .. there isn't anything else !! though his mind continue to stay young, it still doesn't make him inhuman. gee .. what was that about. I have the DVD for sometime now but somehow didn't feel the urge to watch it. Maybe I should after your rave review, eh? Thanks for the nudge. I may need the Kleenex box nearby too. 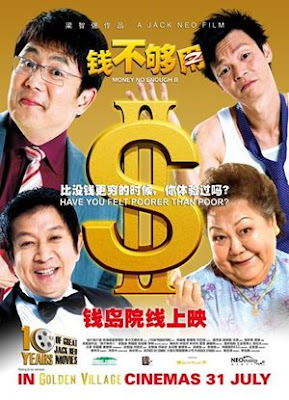 I've watched Money No Enough 2. yes, the movie's not bad!! $$$ no enuf 2 was a good one. it moved me to tears but hillarious at the same time. Among all the 3, I only watched "Money Not Enough". A good movie! You haven't told us how much is a ticket costs. jam, the tickets cost RM8 for "Halloween" and RM10 for "Eagle Eye" and "Money No Enough 2". The Raya movies are available at showbox app. The video player and TV showbox application allows people to update the latest movies. This is the product provided by showboxvpn.com!